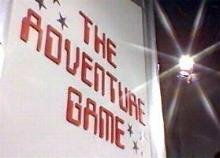 Before The Crystal Maze (which narrowly misses out on being a show of the 1980’s since it first appeared in 1990) there was the fondly remembered The Adventure Game from the good old BBC. Instead of members of the public, The Adventure Game pitted teams of three celebrity guests against an array of fiendish puzzles, wrapped up in the concept of being an alien game show! Presented in a similar style to The Hitchhikers Guide to the Galaxy (indeed, Douglas Adams was asked to write the series, but was busy with Hitchhikers) the show is set on the otherwise insignificant planet of Arg, which is populated by a race of dragon like creatures with shape shifting abilities called the Argonds. Anagrams of the word DRAGON played a large part in the show, with the customary Argond greeting being Gronda Gronda, the planets currency being the Drogna, and characters in the show being called Dorgan, Gandor, Dagnor and of course the great Rangdo. The latter was the ruler of Arg, who didn’t like taking human form like the rest of the Argonds, instead choosing to appear as an Aspidistra pot plant, or possibly a Teapot. So, groups of three celebrities of the day such as Johnny Ball, Lesley Judd, Graeme Garden and Keith “Cheggars” Chegwin would try to solve various puzzles in order to escape back to Earth. Most of these problems could be solved logically, even if deriving that logical solution was sometimes a bit twisted. Some challenges were different each week, but there were some staples such as sending a robot dog through a maze, or the celebrities having to guide one of their number through a pitch black maze, which they could view using an infra-red camera. One of the least understood yet longest running puzzles was the Drogna Game. Based around the planets currency, which consisted of round plastic disks with a coloured geometric shape in the middle, the contestants had to negotiate a grid of Drogna shapes to win. The rules were never explained, instead the contestants had to work them out by trial and error by stepping on different squares on the grid and hoping a klaxon didn’t go off. I never managed to work out the rules of the Drogna Game, but it had something to do with the value of each shape of Drogna. Thanks to the BBC’s Adventure Game website I can reveal that a Drogna was worth the value of it’s colour (ordered by the rainbow, with red = 1, orange = 2 etc.) multiplied by the number of sides of the shape. At the end of every show the contestants had to brave the Vortex, which meant getting all three contestants from one side of a series of triangular pathways to the other. Trying to stop them was the Rangdo, who was moving the invisible (to the contestants) Vortex around the pathways. If they stepped into the Vortex, or the Vortex caught them, they were deemed “evapourated”, which basically meant instead of being given a ride back to Earth aboard a spaceship, they had to walk home. Cue shot of the failed contestants against a starry background. 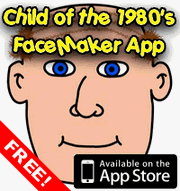 In all there were four series made between 1980 and 1986, with each differing slightly from the last in terms of puzzles and cast. For example, in the first series Moira Stewart (yep, the TV newsreader – don’t believe me, check out the video clip below!) played the part of one of the Argonds, whilst in the second series there was the recurring theme of the contestants trying to rescue Lesley Judd from Arg (she was a contestant in the first series who had stayed on Arg). Trouble was Ms. Judd was actually a double agent, dubbed the Mole, who was actually there to mislead the contestants. This entry is filed under TV - Miscellaneous	and was posted on April 2nd, 2008. You can follow any responses to this entry through the RSS 2.0 feed. You can leave a response, or trackback from your own site. Frighteningly the Adventure Game isn’t complete in the BBC Archives – they were junking episodes of it in the mid/late 80s. Yep, that was the Great Rangdo, ruler of Arg.